Bulldog by Mellanie Collins is licensed under a Creative Commons Attribution-NonCommercial 3.0 United States License. 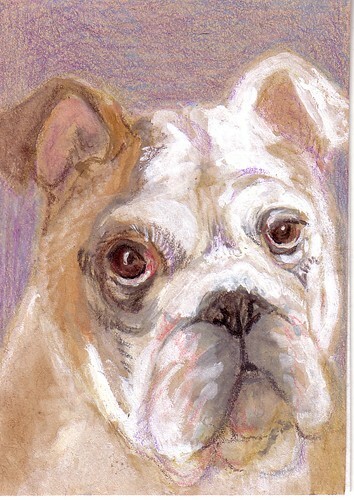 Here’s a little bulldog drawing for an artist trading card I made by request. I have mixed feelings about this drawing. I think the eyes turned out okay, but it just seems to be missing something. Maybe it’s that the whites are too white. I’m still experimenting with gouache and not quite comfortable with it. This is beautiful! The pup is perfect…maybe just a darker background to make those whites pop even more (?) Looks like you and gouache are gonna have a good time together. Thanks Nancy! You’re right. I should have darkened the background. It does look sketchy compared to the dog. I’m so glad you like him. This is adorable…great work..such character…Love it..! Thanks Robin! So pleased that you stopped by.